Can older people travel to The Islands of Tahiti ? Older people will find no problems travelling to The Islands of Tahiti, as there are excellent medical facilities available. You are recommended to bring with you your medical records including your medical history and current state of health. If you have a regular doctor you should also have his full contact details. 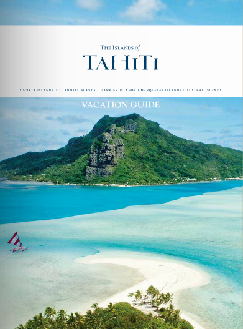 Finally, before you leave for The Islands of Tahiti, check that you have adequate insurance cover for your holiday. Tipping is not expected by hotel and restaurant staff, but it is still a way for the visitor to reward good service and show appreciation. There are no rules or customs as to the amount of the tip. In The Islands of Tahiti, a service charge has been included on the bill for accommodation and dining in large hotels since 2007. At the end of the year, the collected charges are divided up and distributed to the staff, giving incentive to employees to provide top-notch service. Where can you buy postcards and stamps? Most souvenir shops sell postcards of our islands. For stamps, the central Post Office of Papeete, situated near the yacht quay and the Parc Bougainville, is open from 7 am to 6 pm during the week and from 8 am to 11 am on Saturdays. It also has a philatelic centre. What administrative formalities to get married in The Islands of Tahiti ? plus, for those in the armed forces, certificate of presence in the profession. What is the weather like in The Islands of Tahiti ? At Polynesian latitudes, it is summer all year round! 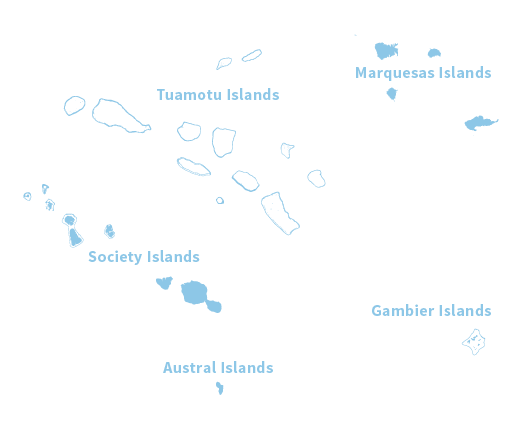 Being much further from the Equator, the islands furthest to the south, the Austral and Gambier Islands, have cooler temperatures than the Society and Marquesas Islands. 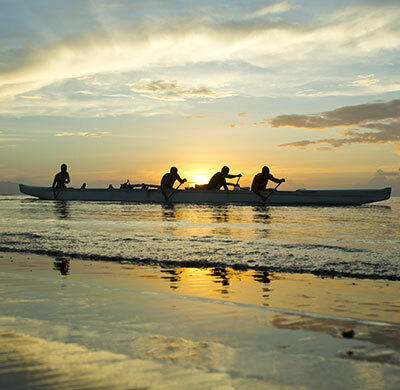 As for the Tuamotu Islands, it enjoys record-breaking sunshine, reaching nearly 3,000 hours of sun per year. Where can you connect to the Internet? For the past few years The Islands of Tahiti have been enjoying unlimited high-speed Internet service, widely distributed throughout the islands, thanks to the Honotua fibre optic submarine communications cable system that connects the islands to Hawaii, USA, replacing satellite connections. Internet cafés exist on the most frequently visited islands (Tahiti, Moorea, Bora Bora, etc.). Most hotels now have Internet centres or offer Wi-Fi connections, sometimes at no charge. How to call in The Islands of Tahiti ? You can purchase pre-paid OPT cards to make a call from any landline telephone, mobile phone or phone booth. Most of the inhabited islands still have phone booths that use cards. The prepaid “OPT Card” is sold at the Tahiti Philately website (www.tahitiphilatelie.com), in all 80 Post Office branches and by licensed retailers. For the last few years, mobile phone network coverage has been expanding by leaps and bounds throughout The Islands of Tahiti, rates have been falling and there is a wide variety of service plans on offer. Vini : You can buy Vini cards and top up your pre-paid card at any post office branch or from a licensed retailer. You can also top up the cards online at www.vini.pf. In case you leave your mobile phone at home, you can purchase a ready-to-use Viniphone pack (mobile phone + phone number + card credits) . Vodafone : Vodafone cards are sold by licensed retailers. What type of electric current is used? Some hotels offer either 110 or 220 volts (alternating current) but we strongly recommend the use of an adaptor for any equipment you bring, including computers. What are the official and spoken languages? 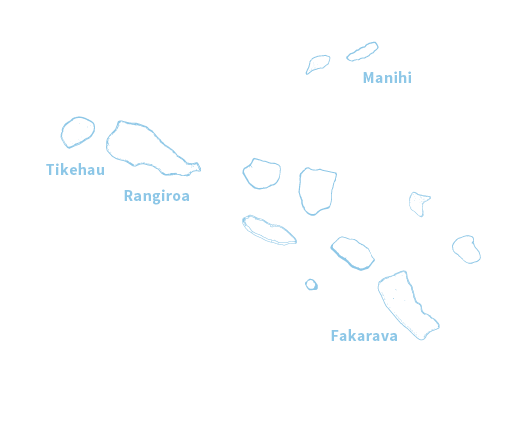 The official language is French, but the indigenous languages, including Tahitian, are still widely spoken in each archipelago. English is also widely spoken, especially in tourist areas. Would you like to learn some Tahitian? What are the customs regulations concerning the movement of goods? You can drink the tap water in Papeete and throughout the island of Bora Bora. In the other islands, ask if you can drink it or not. If in doubt, use mineral water from sealed bottles. Do you need any vaccinations before travelling? Tahiti Tourisme reminds travelers that vaccination against yellow fever is obligatory for anyone who has stayed in a endemic country and wishing to visit The Islands of Tahiti. Vaccinations are also required for travellers from countries where there are risks. 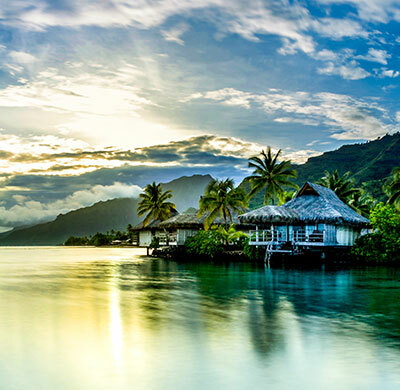 On the Island of Tahiti, health services and facilities are available. 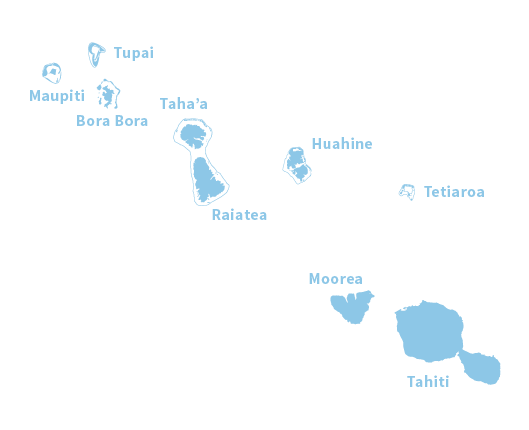 Papeete, Taravao (Tahiti peninsula) and Uturoa (Raiatea) have full hospital facilities (hospitals and clinics). The other islands visited by tourists have at least an infirmary or medical dispensary.